is also written as sin. Look at the triangle above. Do you notice the following? We need the value of angle, α. Notice that the sides of the triangle are labeled appropriately 'opposite side' and hypotenuse' relative to the unknown angle α. 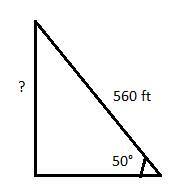 Take note that the hypotenuse is not considered opposite or adjacent to the angle α. Note that the inverse sign is used above. This value can be found using your calculator. 1) If any two values i.e. the 2 sides or, an angle and a side, are given, the missing angle or side can always be found by simply substituting the correct values in the formula. 2) It always helps to draw the diagram to get an accurate picture of what's being asked. 3) Use the calculator to enter the values of sine and inverse sine. ground, (a) how far up the building wall does the ladder reach? Solve for the opposite side using sine since the hypotenuse and angle is given. The construction of a ramp for wheelchairs is currently underway in the new building facility in St. 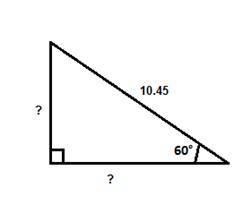 Solve for the angle using sine since the hypotenuse and opposite sides are given. A flat 21 foot ramp rests with one end on the ground and the other end on a 3 foot ledge. (a) What is the measure of the angle created here? (b) How far from the base of the ledge is the far end of the plank? Mike on the ground, what is the vertical height of the kite?